The What’s On for Sept/ Oct ’82. Genisis P. Orridge was born in M/c so does that qualify him as a Manchester artist...? It says on one of these Hac. 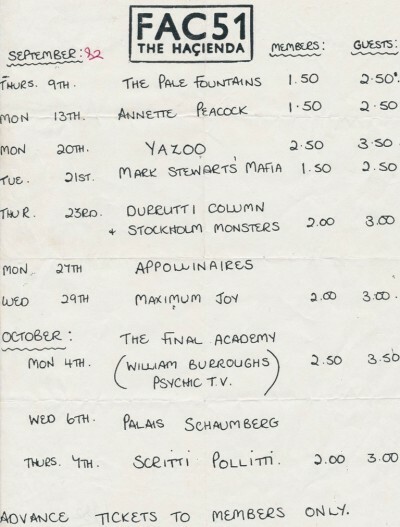 newsletters that Scritti Polliti didn’t end up playing; was quite partial to that man/band. “Skank Block Bologna” was quite experimental till he got more and more smooth. I still reckon that “Sweetest Girl” is a beautiful piece of music though. I first heard that on a free cassette you got for sending tokens from N.M.E. I think it was called C82, part of a series, and it was the standout track ,(well the only one I can remember by now), and lyrically did the bizz as well. Thinking of that it just reminded me of those old hippies Here and Now's "What You See is What You Are" from a similar time. If anyone's got a copy of that that needs "minding" for the foreseeable future then it's possible I may be able to oblige. Tried and failed. There's obviously an easier way to do this but says I can't view it. Will try with some assistance later. .....sussed it;highlight/copy/paste...piece 'o piss. Geez, haven't heard that for 30 years or so. Don't remember the guitar change bit halfway through but the first bit still sounds damn catchy;me old grey hippy roots showing through.Cheers. No problem; your post reminded me of it for the first time in yonks so I had to go searching!